It was after 10 o'clock on a school night and the final scores had yet to be announced. Both teams had left the building but Coach Fran Parry of Gaithersburg and Coach Nicholas Snyder from Thomas Johnson remained. The announcer read off the team rankings from ten to three before pausing. The two coaches waited and then shook hands when the announcement came that the two teams tied for the state title. Then came the discussion as to who would take home the trophy. Someone mentioned that it was Thomas Johnson's first state title and Parry threw his hands up in the air and told Snyder to take it. A state title is nothing new to Parry who has now coached 5 state champion track teams (4 outdoors and 1 indoors), and this gesture seemed much appreciated by the younger coach from Thomas Johnson. 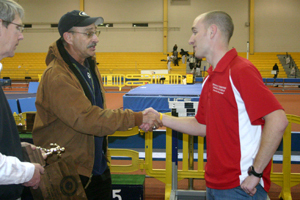 Neither coach would say that their teams performed flawlessly, and in fact all of the athletes and coaches on both teams appeared nervous as the meet came to a close. It was the Montgomery County athletes from Quince Orchard and Northwest who actually played "spoilers" and made the team battle especially interesting. Thomas Johnson entered the meet with the top seeds in the 4x200-meter relay and 4x400-meter relay but took second place in both events. Eleanor Roosevelt won the 4x2 while Northwest won a very exciting 4x4. Just a week earlier at the 4A west region meet, Northwest was leading Thomas Johnson by a large margin in the 4x400 relay before TJ's Marquis Woodyard closed that gap and out-leaned NW's Chris Onuigbo at the finish line. It was a thrilling finish to a great region meet, but one that Onuigbo was visibly distraught about. Onuigbo found himself once again with a 2 second lead over Thomas Johnson on the final leg of the 4x4 relay at the state championship. Not only had he been caught by Woodyard a week earlier, he was also upset that his team's 4x200 relay was disqualified for false starting earlier in the day. He was able to successfully keep Woodyard at bay to claim the 4A 4x4 title in a time of 3:27.55, a season best time among MCPS teams this season. Onuigbo has struggled with injuries this season and the 4x4 victory offered some redemption for an otherwise disappointing season. Plantar fasciitis has prevented him from being his normal self, but he said he will be ready for the open 400 and 800 this coming outdoor season. Thomas Johnson was counting on all ten points from the 4x4, but it never would have been in position to win without the help of pole vaulter Erick Artusio. Artusio was one of the stars of the meet as all eyes in the fieldhouse were on him as he attempted to clear 14 feet, 14 feet 6 inches, 15 feet to tie the state record, and finally 15 feet and 2 inches for sole possession of the state record. On his final attempt at 15-2, fans could barely see Artusio brush the bar and roared with approval before collectively sighing as the bar fell to the ground. While Northwest and Eleanor Roosevelt played spoiler for Thomas Johnson, Quince Orchard High School played spoiler for Gaithersburg. In one of the biggest upsets of the meet, QO's Marcus Brown topped Gaithersburg's Sean Stanley in the shot put with a throw of 56-07.75. Stanley, who was previously unbeaten against Maryland competition in the shot put for two years, nearly didn't get a mark at all. It was for sure an off day for him that cost the team two points, but it could have been much worse had he failed to land any of this throws cleanly. Brown's mark was nearly a foot off of his season best, but he was thrilled with the win. He is excited to finish out his high school campaign outdoors where he says the discus is going to be really good. 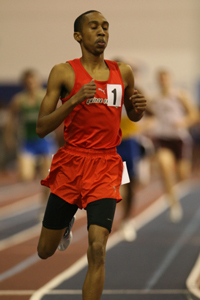 On the track, QO's Wayne Bartholomew had epic runs in the 500-meter dash and the 800-meter run to win both state titles, set the 800-meter state record, and hurt Gaithersburg's chances of a state title even further. 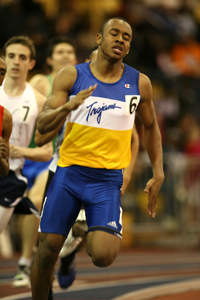 In an early-season interview with mocorunning, Antonio Palmer said, "There were some times when I would wonder why I was always pit against the best runners from the 1st day I stepped on the track." Many thought this would finally be Palmer's time to dominate, but Bartholomew raised his game and perhaps caught Palmer off guard with his speed. Palmer and CH Flowers's George Empty led early in the 500, but Bartholomew moved to the front and opened up a gap after a lap and a half. With a lap to go, he hit his top gear. Empty and Palmer responded but could not accelerate enough to make up ground as Bartholomew sprinted to the win in 1:04.92, the fifth fastest time all-time at the Maryland state meet. Later in the 800, Bartholomew was swallowed up by the pack early while Palmer and Jovon Edwards of Eleanor Roosevelt took the lead. After Edwards led the pack through 400 in 57 seconds, Palmer took over the lead with one lap to go. Bartholomew again moved up to the front and opened up a lead on Palmer in the blink of an eye. Both runners sprinted around the track at top speed, but Bartholomew's lead did not diminish one bit. Bartholomew got the win in a state record time of 1:55.98. Palmer was second in 1:58.88. Bartholomew was surprised by his own speed. He ran the race exactly as he planned to and couldn't believe the times that he ran at first. The 1:04.92 especially surprised him, as it was nearly a full second faster than the PR that he set a week earlier. He plans to run the 800 at Nike Indoor Nationals, but after his run in the 500 he may consider running the 400 at nationals, too. Owen Cain of Gaithersburg was also off his game. His time of 7.91 in the 55-meter hurdles was nearly two-tenths of a second off his best time and was only good enough for fourth. Luckily his teammate Alimamy Kallay came up big with a 5th place finish in the hurdles which was good for 2 points. Cain didn't even have his way in the high jump despite winning with a jump of 6-2. After jumping 6-7 earlier this season, he should have won with ease, but found himself in a jump off with Linganore's Richard Graham early on. Cain won the state title in the jump off. In the end, 38 points was it. Nobody from Gaithersburg had their best day, but luckily the 38 points was enough to tie for the state title, their first indoor or outdoor title in seven years. Solomon Haile of Sherwood had his way in the distance events, tiring out his competition in the 1600 and 3200 meter runs by negative splitting both races. Haile was running roughly 33 seconds per lap with Andrew Palmer of Whitman right on his tail before he dropped a 30 second lap with 400 meters to go. This opened up a gap on Palmer for Haile to cruise home with another 30 second final lap. Haile won in 4:18.74 while Palmer was second in 4:21.42. Haile's splits in the 3200 were even more extreme as he coasted through the first 1600 meters in 4:49 with Palmer of Whitman, Brian Faherty of Eleanor Roosevelt, and Kyle Balderson of Sherwood closely behind. 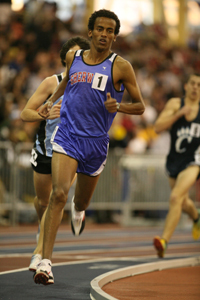 Almost as soon as he crossed the 1600-meter mark, Haile increased his lead by two seconds over the rest. He increased his lead exponentially each lap, closing in 4:30 for the win in 9:19.74. It topped the state record of 9:25.53 set ten minutes earlier in the 3A race by Atholton's Michael Lynch. Hassan Dixon of Northwest had the top times in the 55-meter dash and 300-meter dash. His time of 6.66 qualified him for the 55-meter finals, and he finished fourth overall with a time of 6.71 behind winner Deontray Lee of Broadneck. He finished second in the 300-meter run with a personal best time of 35.27 behind Roosevelt's Denny Long. It wasn't the outcome that Churchill wanted, but Churchill and Broadneck put out tremendous efforts in the boys 4x800 relay race. Churchill led Broadneck for nearly every lap of the race, both teams splitting very close to 2:00 on each leg. The race was neck and [Broad]neck with one lap to go when Broadneck's anchor unleashed a furious kick for which Churchill's Will Draffin had no answer. The Broadneck runner sprinted the final lap for a split of 1:56 and an overall time of 8:02.05. Draffin brought it home for second place in 8:06.64. COngratualtions Wayne. I am going to Trinidad!! !